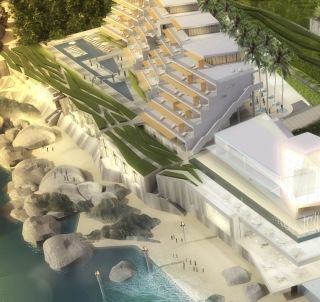 This new resort, opening in 2008, will be the first new luxury resort to be built in Bermuda in 35 years. It will include 135 fractional residences. Situated on 37 acres of Bermuda's prestigious South Shore, Jumeirah Southlands will have 300 spacious balcony suites, including 17 incomparable two-story suites built into beach cliffs, as well as five restaurants and bars, a nightclub and outdoor entertainment space, a complete spa, over 1,700 feet of beach, numerous pools, an executive conference center and an equestrian center. There will also be a collection of luxury boutiques on-property. The resort will have a contemporary, innovative design (see the artist impressions on the right) and the highest levels of amenities. Craig Christensen one of the resort's Bermudian owners, said, "Jumeirah Southlands will be one of the most exciting resorts in the world. Because we are fully committed to making this a resort all Bermuda can be proud of and will benefit from, we have gone to extremes to seek out the most innovative architects, the very finest designers working in the global resort industry and what we believe to be the world's best hotel company." The resort will be located 15 minutes from Hamilton, Bermuda's capital and 30 minutes from the airport. Bermuda has direct flights from 14 US cities including Atlanta, Boston, Chicago, Miami and New York and flights from Toronto and London. Jumeirah is a fast growing Dubai based luxury international hospitality group. Its properties include the sail shaped seven star Burj Al Arab in Dubai (claimed to be the world's most luxurious hotel), the Jumeirah Carlton Tower and Jumeirah Lowndes Hotel in London and the Jumeirah Essex House on Central Park South in New York.